Production: Westi/Société générale de films, Paris; black and white, 35mm, Polyvision (some versions without Polyvision); running time: originally about 270 minutes, but the film has always existed in several versions, some up to 5 hours in length; length: originally about 32 reels. Released 7 April 1927, Paris. Released without Polyvision 1929, New York. Re-released 1934 with sound. In 1971 Napoléon— Bonaparte et la Revolution was re-released with sound and with some footage added and some eliminated. In 1981 Napoléon , the original version, was restored by Kevin Brownlow and re-released in its entirety with music by Carl Davis, also re-released in the US by Francis Coppola with some footage cut and music by Carmine Coppola. Filmed 1925–26 in France. Producers: Wengoroff and Hugo Stinnes; screenplay: Abel Gance; photography: Jules Kruger, Léonce-Henry Burel, Jean-Paul Mundwiller, assisted by Lucas, Briquet, Emile Pierre, and Roger Hubert; editors: Marguerite Beaugé and Henritte Pinson; production designers: Alexandre Benois, Schildnecht, Jacouty, Meinhardt, and Laourie; music: Arthur Honegger; consultants: Jean Arroy, Jean Mitry, and Sacher Purnal; assistant directors: Henry Krauss, Alexandre Volkov, and Viatcheslaw Tourjansky. 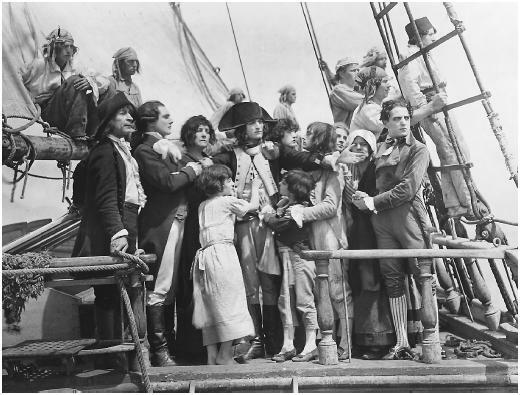 Cast: Albert Dieudonné ( Bonaparte ); Vladimir Roudenko ( Young Bonaparte ); Edmond van Daele ( Robespierre ); Alexandre Koubitsky ( Danton ); Antonin Artaud ( Marat ); Abel Gance ( Saint-Just ); Pierre Batcheff ( Hoche ); Maxudian ( Barras ); Chakatouny ( Pozzo di Borgo ); Philippe Hériat ( Salicetti ); Nicolas Koline ( Tristan Fleuri ); Daniel Mendaille ( Fréron ); Alexandre Bernard ( Dugommier ); Philippe Rolla ( Masséna ); Robert Vidalin ( Camille Desmoulins ); Roger Blum ( Talma ); Paul Amiot ( Fouquier-Tinville ); Boudreau ( La Fayette ); Georges Lampin ( Joseph Bonaparte ); Alberty ( J.-J. Rousseau ); R. de Ansorena ( Desaix ); Jack Rye ( Louis XVI ); Armand Bernard ( Jean-Jean ); Albert Bras ( Monge ); Georges Cahuzac ( Beauharnais ); Favière ( Fouché ); Harry Krimer ( Rouget de Lisle ); Genica Missirio ( Murat ); Rauzena ( Lucien Bonaparte ); Viguier ( Couthon ); Vonelly ( André Chenier ); Jean d'Yd ( La Bussière ); Gina Manès ( Joséphine de Beauharnais ); Annabella ( Violine Fleuri ); Suzanne Blanchetti ( Marie-Antoinette ); Eugénie Buffet ( Letizia Bonaparte ); Damia ( la Marseillaise ); Yvette Dieudonné ( Elisa Bonaparte ); Marguerite Gance ( Charlotte Corday ); Simone Genevois ( Pauline Bonaparte ). Gance, Abel, Napoléon vu par Abel Gance , Paris, 1927; selections in Ecran (Paris), April-May 1958. Arroy, Jean, En tournant "Napoléon" avec Abel Gance: Souvenirs et impressions d'un sans-culotte , Paris, 1927. Sadoul, Georges, French Films , London, 1953. Icard, Roger, Abel Gance , Toulouse, 1960. Mast, Gerald, Film/Cinema/Movie , New York, 1977. Kramer, Steven, and James Welsh, Abel Gance , Boston, 1978. Brownlow, Kevin, Napoléon: Abel Gance's Classic Film , London, 1983. Icart, Roger, Abel Gance; ou, Le Promethée foudroyé , Lausanne, 1983. King, Norman, Abel Gance: A Politics of Spectacle , London, 1984. Groppali, Enrico, Abel Gance , Florence, 1986. Kaplan, Nelly, Napoléon , London, 1994. Graham, James, in New York Times , 5 June 1927. "France Films Her Napoleon," in New York Times , 4 March 1928. Hall, Mordaunt, in New York Times , 12 February 1929. Gance, Abel, "Les Nouveaux Chapitres de notre syntaxe," in Cahiers du Cinéma (Paris), October 1953. Gance, Abel, in Cahiers du Cinéma (Paris), December 1954. Thompson, Howard, in New York Times , 25 September 1967. Lenning, Arthur, "The French Film—Abel Gance," in The Silent Voice: A Text , New York, 1969. Brownlow, Kevin, in Films and Filming (London), November 1969. Blumer, R. H., "The Camera as Snowball," in Cinema Journal (Evanston, Illinois), Spring 1970. Greenspun, Roger, "Bonaparte and the Revolution," in New York Times , 16 October 1971. McKegney, Michael, in Village Voice (New York), 11 November 1971. Brownlow, Kevin, "Abel Gance's Napoleon and the Revolution ," in Sight and Sound (London), Winter 1971–72. Canby, Vincent, in Film 71/72 , New York, 1972. Gilliatt, Penelope, in New Yorker , 6 September 1976. Brownlow, Kevin, " Napoléon —A Personal Involvement," in Classic Film Collector (Indiana, Pennsylvania), 23 August 1977. Everson, William K., in Variety (New York), 12 September 1979. Grant, F., in Broadcast (London), 8 December 1980. Eisenschitz, B., "The Music of Time: From Napoleon to New Babylon ," in Afterimage (London), no. 10, 1981. Pappas, P., "The Superimposition of Vision: Napoleon and the Meaning of Fascist Art," in Cineaste (New York), no. 2, 1981. Brownlow, Kevin, in American Film (Washington, D.C), January-February 1981. Everson, William K., "The Many Lives of Napoleon," in Film Comment (New York), January-February 1981. Elley, Derek, in Films (London), February 1981. Welsh, James M., in Films in Review (New York), March 1981. Allen, W., interview with Kevin Brownlow, in Stills (London), Autumn 1981. Assayas, O., "Mensonges et vérités," in Cahiers du Cinéma (Paris), December 1981. Hogenkamp, B., in Filmfaust (Frankfurt), December 1981-January 1982. French, Sean, "The Napoleon Phenomenon," in Sight and Sound (London), Spring 1982. Abel, R., "Change and Counter-Change: Coherence and Incoherence in Gance's Napoléon ," in Film Quarterly (Berkeley), Spring 1982. Vallerand, F., " Napoléon Coppola et les autres," in Séquences (Montreal), April 1982. Verstappen, W., in Skoop (Amsterdam), June 1982. Tobin, Yann, "Sur Napoléon d'Abel Gance: La Folie du docteur Gance," in Positif (Paris), June 1982. Aristarco, G., in Cinema Nuovo (Turin), August-October 1982. Icart, Roger, "La Representation de Napoleon Bonaparte dans l'oeuvre d'Abel Gance," in Cahiers de la Cinémathèque (Perpignan), Autumn 1982.
" Napoléon Issue" of Cinématographe (Paris), November 1982. Arnaud, C., and Jean Mitry, "Sur les ailes de l'aigle: Notes sur Napoléon ," in Cinématographe (Paris), December 1982. Philpott, R., "Whose Napoleon?," in Framework (Norwich), 1983. Jeancolas, J.P., "Gance au Havre," in Positif (Paris), January 1983. Lardeau, Y., "L'Empereur contre-attaque," in Cahiers du Cinéma (Paris), September 1983. Bassan, R., in Revue du Cinéma (Paris), September 1983. Leblanc, G., "Gance dans le regard de l'aigle," in Cinéthique (Paris), May 1984. Weijel, H., in Skoop (Amsterdam), November 1984.
" Napoléon Issue" of Skrien (Amsterdam), November-December 1984. Nørrested, C., in Kosmorama (Copenhagen), December 1984. Deburchgrave, K., in Film en Televisie (Brussels), January 1985. Stewart, Garrett, "Leaving History: Dickens, Gance, Blanchot," in The Yale Journal of Criticism (New Haven), vol. 2, no. 2, Spring 1989. Arnold, Gordon B., "From Big Screen to Small Screen: Napoleon Directed by Abel Gance," in Library Journal (New York), vol. 114, no. 9, 15 May 1989. Lafaye, C., "Gance et 'son' Napoléon ," in Cahiers de la Cinémathèque (Perpignan, France), no. 53, 1990. Comuzio, E., "La musica dell'Imperatore salvata dal diluvio," in Cineforum (Bergamo, Italy), May 1990. Gordon, M., "Some Things I Saw," in Salmagundi (Saratoga Springs, New York), Fall-Winter 1990–1991. Gerstenkorn, Jacques, "L'empire de l'analogie," in Vertigo (Paris), no. 6–7, 1991. Seville, J., "The Laser's Edge: Napoléon vu par Abel Gance ," in Classic Images (Muscatine), no. 194, August 1991. Conforti, A., and M. Lori, "La metafora nel cinema: Napoléon di Abel Gance," in Cineforum (Bergamo, Italy), July-August 1992. Fernandez, C., " Napoléon vu par Abel Gance : el poder de la mirada—Napoleon y el aguila," in Film-Historia (Barcelona), vol. 5, no. 1, 1995. The showing of Napoléon vu par Abel Gance on 7 April 1927 at the Opéra in Paris was in every sense a triumphant occasion. For the invited audience it meant the culminating point of the restoration of French cinema after its virtual annihilation in 1914. For writer-director Abel Gance himself it was the climax to 18 years of work in the cinema and 10 years of rigorous and innovative exploration of the visual potential of the medium. Napoléon alone had taken three years of unremitting research, writing and shooting, cost several million francs, involved thousands of extras and a team of a dozen assistants and at least eight cameramen and directors of photography. The project had been initially conceived as a massive six-part work which was to include the whole of Napoleon's life. The eventual six hours of edited footage in fact covers only a portion of the first part of this grandiose scheme, so the scale of Gance's imagination is immediately apparent. The truncation of the project means that though Napoléon has a greater sweep than any other Gance epic, it lacks the tragic resolution which usually completed Gance's tales of heroic endeavour, whether that of Jean Diaz in J'accuse , Savaronola in Lucrèce Borgia , or Beethoven in Un grand amour de Beethoven . Despite its length, the film offers only the education and shaping of its hero, leaving him at an early point of triumph—the entry of his armies into Italy. It is the technical aspects of Napoléon that have always received the most attention. The context in which Gance was working was one highly receptive of visual experimentation. After the constriction of the pre-1914 system organised by Charles Pathé and Léon Gaumont, in which Gance had made his debut, the new postwar generation to which he belonged strove to give a new dignity to the cinema. Despising the underfinanced, totally commercially oriented cinema of the early 1910s, with its philistine disregard for artistic aspiration and its conception of films as products to be made as if they were canned peas, Gance and his contemporaries strove to develop the visual potential of the new medium, experimenting with mobile cameras and the new editing techniques pioneered by the emergent Hollywood narrative cinema and indulging in a profusion of optical effects—masks and superimpositions, distorting lenses and pulled focus. All of these tendencies reach their climax in Napoléon . To help with the massive project and the manipulation of the crowd scenes, Gance sought the assistance of fellow directors Henry Krauss, Alexandre Volkov and Viatcheslaw Tourjansky. With the aid of a team of cinematographers led by Jules Kruger, Léonce-Henry Burel and Jean-Paul Mundwiller, Gance moved his camera in every conceivable fashion—to imitate a ship tossed by a storm, the view from a galloping horse or even a snowball in flight. As if this welter of visual effects were not in itself sufficently dazzling, Gance arranged for the screen width to be tripled at the end, so that Napoleon's entry into Italy, recorded in widescreen and with triptych effects, becomes a stunningly unique visual experience. The climate of French 1920s cinema was conducive to Gance's project, and there was nothing to restrain his exuberant imagination. The most successful films of the decade were super-productions with an exotic, literary or historical flavour, and Napoléon was designed to outmatch them all. It combined breathtaking virtuosity with a totally personal conception of the subject, and not until the 1970s masterpieces of Coppola and Spielberg do we find a similar harnessing of the entire resources of an industry to an unfettered personal vision. Central to Gance's conception was a 19th-century romantic view of the artist. It has been well observed that just as Un grand amour de Beethoven depicts the artist as hero, Napoléon offers a view of the hero as artist. Though Gance himself played the role of Saint Just, he identified himself as creator of the film with Napoleon (played by Albert Dieudonné) as creator of a new France and master of the forces of history. Napoleon—man of action, politician and military genius— becomes a largely passive figure, a pensive visionary. Much stress is placed on Napoleon's childhood, and the hero's ability to crush dissent with a steely gaze is anticipated in early scenes of the schoolboy leading his side in a snowball fight. The boy is endowed with an all-too-symbolic pet eagle. But if these early scenes are often lively and well-realised, the most remarkable feature of this inevitably uneven work is the handling of action, nowhere better shown than in the celebrated scenes which intercut shots of Napoleon at sea in a tiny boat rocked by a storm with the human storm in the Convention in revolution-torn Paris. In the 1980s Napoléon became probably the most celebrated of all silent masterpieces. Kevin Brownlow's 20-year self-imposed task of bringing together all extant footage of the film is a remarkable endeavour, but for film historians it raises a whole host of questions about authenticity and authorship. There are now two quite different Napoléon restorations, Brownlow's own English version with its music by Carl Davis and preservation of silent running speed, and the version distributed in the United States by Francis Coppola's company which is cut, run at the inappropriate speed of 24 frames a second and endowed with a questionable score by Coppola's father. Moreover, far from simply constituting a restoration of a mutilated film and a recreation of the viewing conditions of silent cinema with full orchestral accompaniment, Brownlow's five-hour version is as much a modern interpretation and distortion as Henri Langlois's seven- or eight-hour compilations of episodes from Judex or Les vampires . These versions led to the rediscovery of Louis Feuillade's work and the restoration of his reputation, but by compressing up to a dozen episodes, designed to be seen separately at fortnightly intervals, into a single massive viewing session, Langlois created a work that owed nothing to 1920s conceptions of film narrative and time-span. This new relationship of film and spectator can have an immediate "modern" impact, as the films of Jacques Rivette, one of the Cinémathèque Francaise's most faithful habitués, show, but it is not a recreation of the 1920s experience. Similarly, Brownlow's "original" version corresponds to none that was ever shown in Paris in the 1920s, and there is nothing to indicate that audiences then would have accepted this five-hour endurance test. The actual Napoléon , like so many silent films, existed in several versions, and the 1927 showings were either of a shortened version with triptych effects (as at the premiere in the Opéra) or a four- or six-episode version without triple screen and shown over a period of weeks. Despite such paradoxes, the Brownlow version has many virtues, not least of which has been its revival of interest in silent cinema. Moreover, whereas Gance's own reworkings of his material—the 1934 sound version, the re-edited 1971 compilation Bonaparte et la revolution —like his 1960s feature Austerlitz , are simplifications and at times trivialisations, this 1980s version restores the work to full complexity and to its status of one of the 1920s most remarkable achievements.